Hair removal doesn’t have to be drudgery as long as you use the right method. That’s where picking the best epilator brand comes into play. Today’s products are more sophisticated and have better designs for making the job less painful and more effective. You can expect to pay under $100 for a decent model, though some high-end ones are north of that price point. Are you ready to consider your options? The way that an epilator removes hair will sound familiar to you if you’ve ever waxed your legs. It removes it by literally taking it out by the root. Unlike waxing, there is no mess or creams to apply. That adds a measure of safety to it by keeping your skin clean. It has the same risks with side effects like redness, swelling and the dreaded ingrown hairs. That’s why it’s essential to wash and exfoliate your skin before you start. Epilators vary at a base level with the type of mechanism they use. The first products made by Epilady had a spring type. You’ll also see models with a tweezer or ones that you can use in the shower. The latter offers the advantage of making the process less painful. The more features a product has isn’t necessarily an indication of quality. Check out the performance specs to make sure you’re getting the best value for your money. We’d be remiss not to include the original model as an option for the best epilator brand. Epilady single-handedly changed the lives of women everywhere when it introduced its product in 1986. Today, the company carries a full-line of epilators including the classic original one. Models vary in speeds, tweezes per minute and power sources. You’ll find products suitable for use on your face and bikini line too. They even have exfoliators that you can use on your feet. Braun Takes Multitasking to the Next Level. Germany-based Braun GmbH is best known for its line of Silk-épil epilators. Its unique technology includes an exfoliator which ramps up its precision to get even short hairs. These products multitask with shaver and massager attachments too. You can use them either dry or wet, making them worthy of being a best epilator brand. Products vary with by the type of technology and the accessories that come with each kit. We liked the smartlight feature found on most models that makes epilating easier. CHAINER Products Include Several Tools in One. One of the things we really liked in the CHAINER line was the fact that many function as more than one tool. The 5-in-1, for example, has two epilators, razor, callus remover and shaver. They’re waterproof too so that you can use them in the shower or bath. They’re also rechargeable which makes it so much easier. The epilators are affordably priced, especially considering all the things they do. The charge time is decent so that you can get it done in one session. Emjoi isn’t the cheapest best epilator brand. But it succeeds on several fronts because of its added safety features. The device provides antimicrobial protection with its Silver Ion Technology. Bacteria can’t exist on silver which explains how it works. Inflammation is one of the main drawbacks of using an epilator. It’s the reason behind the redness, itchiness and swelling some experience. We also liked its proprietary mechanism for preventing ingrown hairs, another bane of using an epilator. You can use it on both your face and legs which makes it versatile too. The manufacturer adds a lot of other details that make their designs more user-friendly such as ergonomic handles and multi-functional models. Philips Offers Affordably Priced to Luxury Epilators. Affordability is a stand-out feature of the Phillips line of products in its economy line. Some are not as powerful as the previous brand we considered. You’ll notice the absence of some features like a built-in light. However, the two-year warranty makes it worth a look for the budget-minded individual. The company also produces a higher end line of epilators that have the extra bells and whistles that some may prefer. Attachments and accessories vary with the model. Higher end models include additional features like massager and hypoallergenic surfaces. Charge time on the rechargeable products is fast with good battery life. Epilators might not be the first thing you think of when you hear this manufacturer’s name, but it produces quality products even with something so far removed from electronics. The focus of many models in its line is functionality. You’ll see it in the operation of the epilator along with the attachments for other features such as a shaver or pedicure tool. Like Philips, you’ll get a two-year limited warranty with your purchase. Their models include a built-in LED light and are waterproof for wet and dry usage. They are affordable with the price varying with the number of attachments you get with the kit. Both charge and operation times are excellent. Panasonic’s’ outstanding reputation makes it a manufacturer worthy of being on our best brand list. We think that its basic features are essential for any epilator. Remington’s line of epilators strives to make the best experience out of hair removal with features that are unique to its brand. We really liked both the precision and massaging caps that increase the versatility and comfort level. The latter includes aloe vera to soothe your skin after your epilating session. The epilator includes a detail light with a pivoting head to make hair removal easier. You can use them both wet and dry. While you may know the company for its line of razors, they do just as well with epilators. You can use the Smooth & Silky line on your legs, bikini area or face with the precision cap attachment. 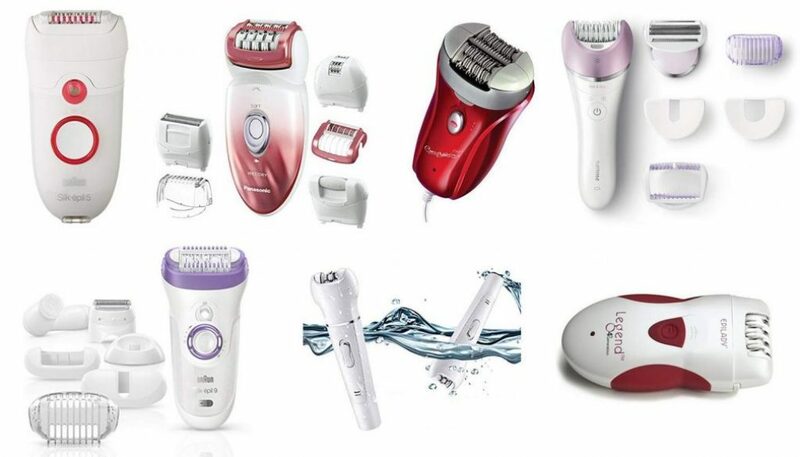 The best epilator brand makes the task of hair removal as efficient and pain-free as possible. Despite its side effects, it’s an excellent option that balances cost with convenience. You will recoup the expense of your one-time purchase quickly versus what you’d have to shell out to keep you stocked with disposables or razor blades. It’s the eco-friendly way to go. If you’re looking for a long-term solution that won’t break the bank, check out your options for getting to the root of the problem.